I've convinced Kati she should get a maxi dress this summer. Well, I should really credit Desigual, as we couldn't resist this dress ($142) when we walked through the "Summer of Love" collection in Macy's Herald Square on the 2nd floor. You may have noticed the Summer of Love windows on 34th Street. Be sure to check out the collection, a fun and colorful boutique full of perfect, flowing dresses and hippie bags for summer. 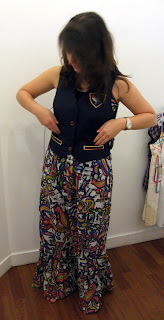 Although it's a crime to cover up that beautiful neckline, I made Kati try the Francis crest vest ($147) with the dress. I am a little obsessed with that vest. These two don't exactly go together, but I love pairing a long dress with a vest. If you really want to emulate the Summer of Love, you'll need a long fringed suede vest swinging alongside your maxi. Check out some more Francis by Christian Francis Roth in Macy's Herald Square here. Don't forget to visit the sales section to the left for a Macy's savings pass, and to print up an H&M Friends & Family deal. H&M Herald Square, 34th & 6th, and H&M, 34th & 7th Ave.
Oh wow, it really is adorable. & I thought I didn't like maxi dresses. She absolutely needs that dress -- it looks beautiful on her. what a beautiful dress. wendyb is right, she needs the dress. That dress is simply amazing. She truly looks beautiful in that dress Miss Fashion, if she hasn't purchased it already, she simply must. No discussion. LOVE that dress! It's different than traditional maxi styles and perfect for summer! Not all maxi dresses are cute, but this one is adorable! I especially love the neckline, and waist band. If you shop Ebates.com, you'll get cash back at Macy's! Hi, this is Desigual, we also have a Desigual Store in NY: 594 Broadway.